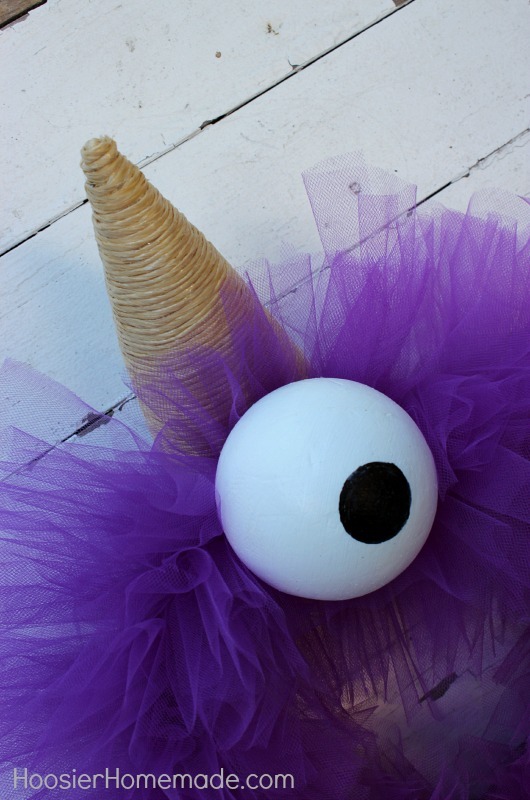 One-eyed, one-horned, flying, purple people eater – one-eyed, one-horned, flying, purple people eater – one-eyed, one-horned, flying, purple people eater sure looked strange to me! Do you remember that catchy tune that was released in 1958? Well, that’s a few years before I was born, but I do remember it. 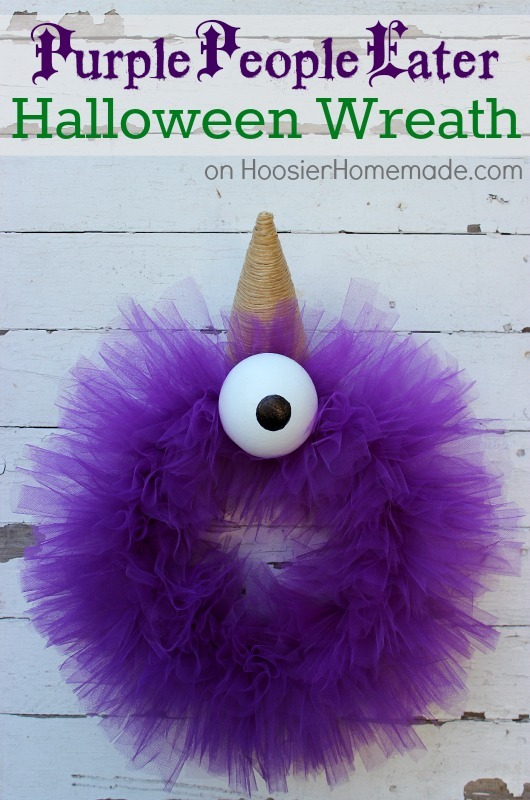 Now that I have that tune stuck in your head (you can thank me later), let’s chat about this fun Purple People Eater Halloween Monster Wreath. 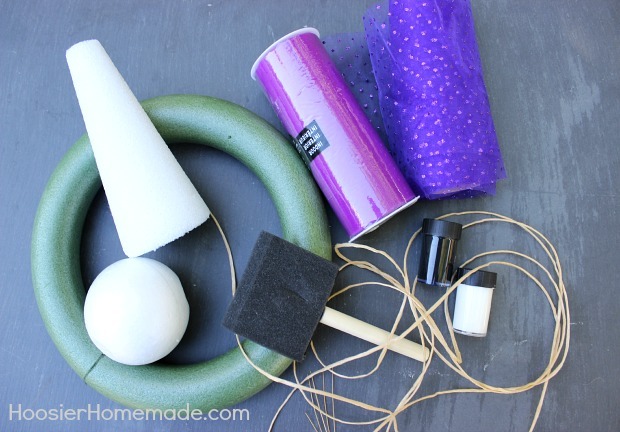 It’s so fun and with just a few supplies and a little time you can make one too! Halloween is one of those holidays that we all love in our house. However, most of the time I like keeping the decorations fun and kid friendly rather than scary and gross, with the exception of Grim – he was pretty cool! I found everything I needed at Walmart. Have you seen their craft department lately? It’s really expanding and many stores have fabric back too! Now it’s time to cut the tulle. You will need pieces about 4 inches longer than your wreath, I cut mine 14 inches. 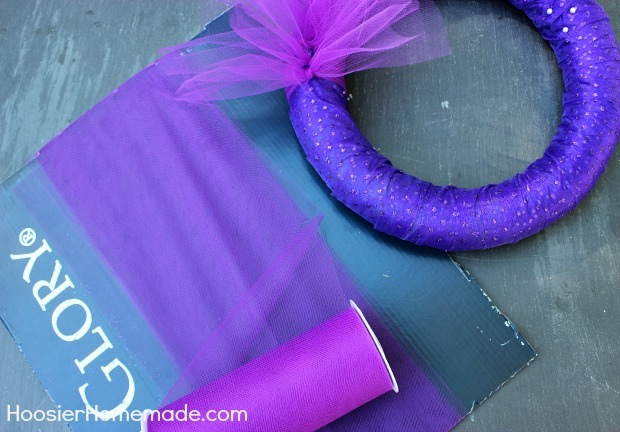 Working your way around the wreath, tie each piece of tulle in a knot around the wreath. I made mine really full, so it was a little tricky at the end. 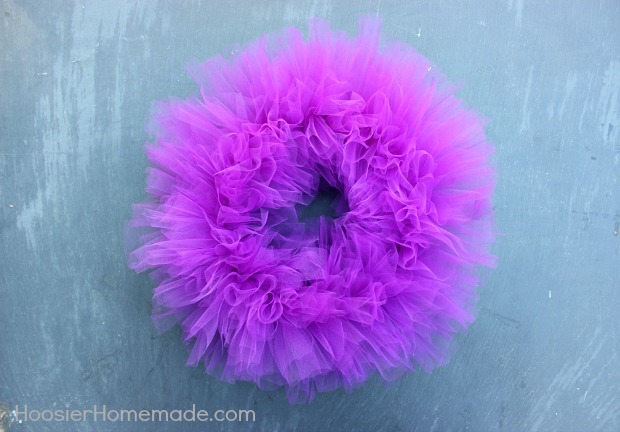 If you have another pair of hands to hold the tulle back so you can tie more strips onto the wreath, it’s work easier. This part took me about an hour, but you could do it while watching your favorite TV show and it will go by quickly. 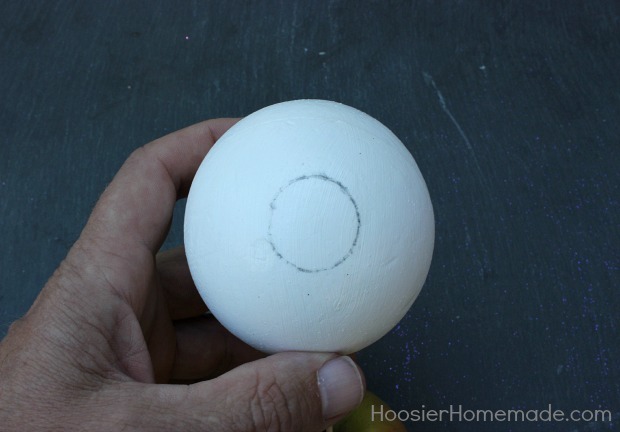 To create the eye, paint a Styrofoam ball with white paint. Use a quarter to trace a circle onto the ball, then paint with black paint. You may need to adjust the size of your circle depending on the size of your eye. 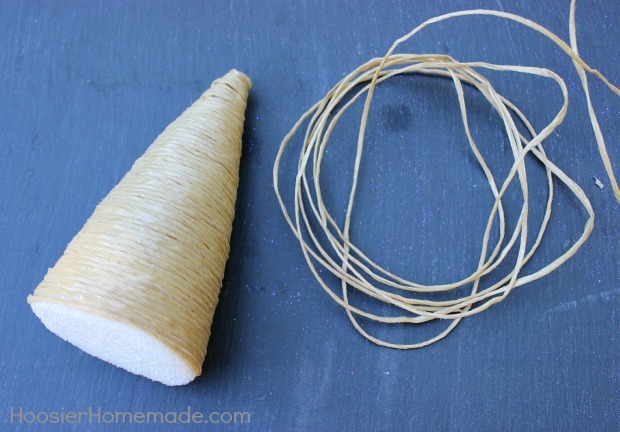 Secure the eye and horn onto the wreath with a skewer or you can also glue them on. We chose the skewer so it would stand out a bit. 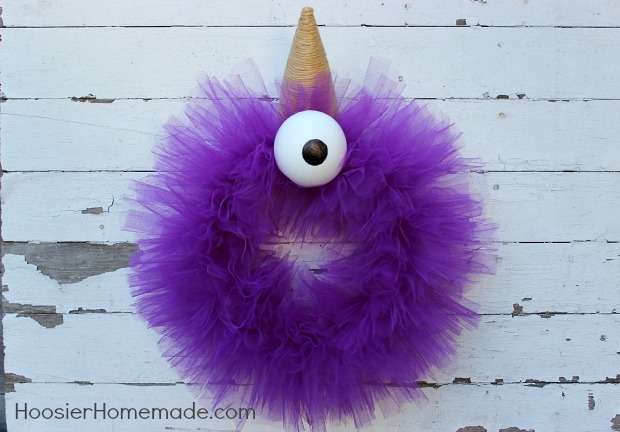 And now your Purple People Eater Monster Wreath is done! And his horn – he has it to play rock ‘n roll music through! 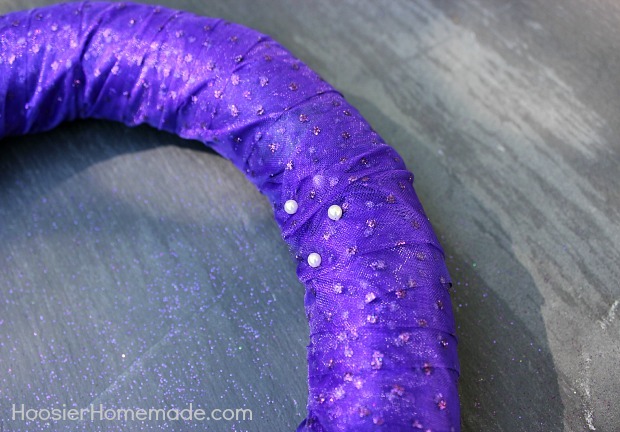 My 5 year old grand daughter and I are making this wreath with the addition on horns and a tail we bought at the dollar store. Hi Tamie, that sounds like such a fun project to do together! Thanks for stopping by! I am so not craftsy but I think I could make this!!! this is too cute!! 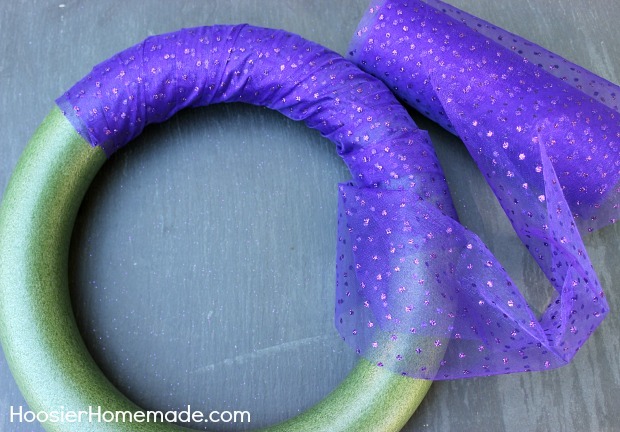 You could totally make this wreath Alice! It’s lots of fun! LOL!!! 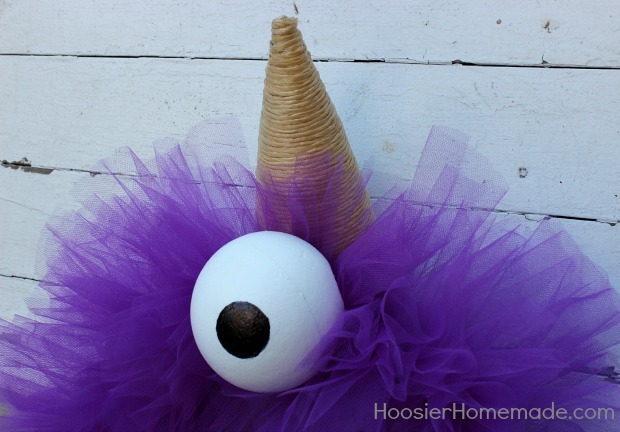 This one-eyed purple people eater made me laugh and sing out loud. What a great idea. We are celebrating Halloween at Saturday Dishes, Liz. This would be perfect. Hope you can come. SO CUTE!!! I may need to go to the store and make this tonight.